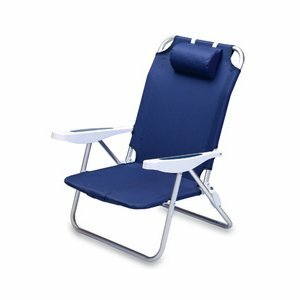 The Monaco Beach Chair is the lightweight, portable chair that provides comfortable seating on the go. It features a 34in reclining seat back with a 19.5in seat, and sits 11in off the ground. Made of durable polyester on an aluminum frame, the Monaco Beach Chair features six chair back positions and an integrated cup holder in the armrest. Convenient backpack straps free your hands so you can carry other items to your destination. Rest and relaxation come easy in the Monaco Beach Chair! Lightweight aluminum frame; 34in chair back;19.5in wide seat that sits 11in from ground; Durable polyester canvas seat and pillow cover; Six chair back positions; Sturdy cup holder in armrest; Maximum weight capacity of 300 lbs.